Downtown Toronto's spot for great coffee and fun, spirited baristas. Check out our online shop for coffee and great merchandise! Jimmy’s Coffee was founded in 2009 on Portland St. in an unlikely, dilapidated residential home. Portland, which was once a quiet street, has become a hub for start-ups, architecture firms and restaurants. We’re proud to be part of the neighbourhood! Coffee on Portland is our flagship store, and when you visit the shop you’ll immediately know why. It’s a small but bustling café, boasting of a small back patio—the perfect King West escape, weather permitting. 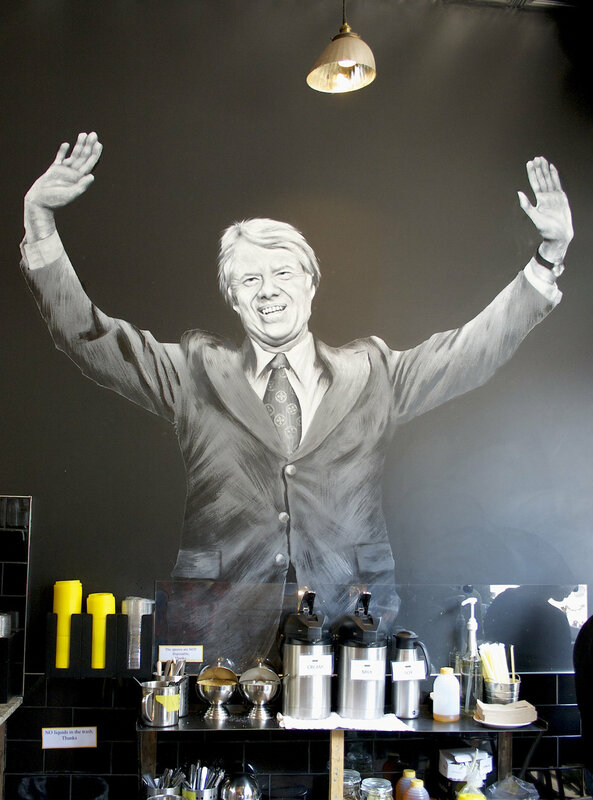 Stop by for the ultimate Jimmy’s Coffee experience. Our newest location, a sister store to our busy original café, located directly across the road on Portland St to ensure all our loyal fans can get their fix. It's a bistro-esque take on the inimitable Jimmy's style transforming a classic Toronto row house, smack dab in the middle of a new "restaurant row". With two-storeys and front & pack patios, 100 Portland has seating that many cafés long for! Featuring specialty products such as nitro cold brew on tap, affagato ice cream and unique treats that you won't find at any other Jimmy's locations. The shop showcases beautiful hardwood floors, intricate tiling, and gorgeous floor to ceiling factory windows to let the sunlight shine in. Not to mention, the vintage 1960s record player console on the second floor where we'll spin classic jams. A Jimmy's experience like no other. Jimmy’s Coffee on Baldwin opened in early 2013 in the heart of Kensington Market. It was the market's unique and intimate community that drew Jimmy’s in and it has since become a popular hangout for locals during the week, and a hot spot for tourists on weekends. Jimmy's Baldwin is highlighted by its beautiful and expansive back patio, Toronto’s perfect downtown oasis. While there is plenty of seating inside, come early to get a seat—the tables quickly fill up with students, artists and locals who hunker down with an Americano and a good book. 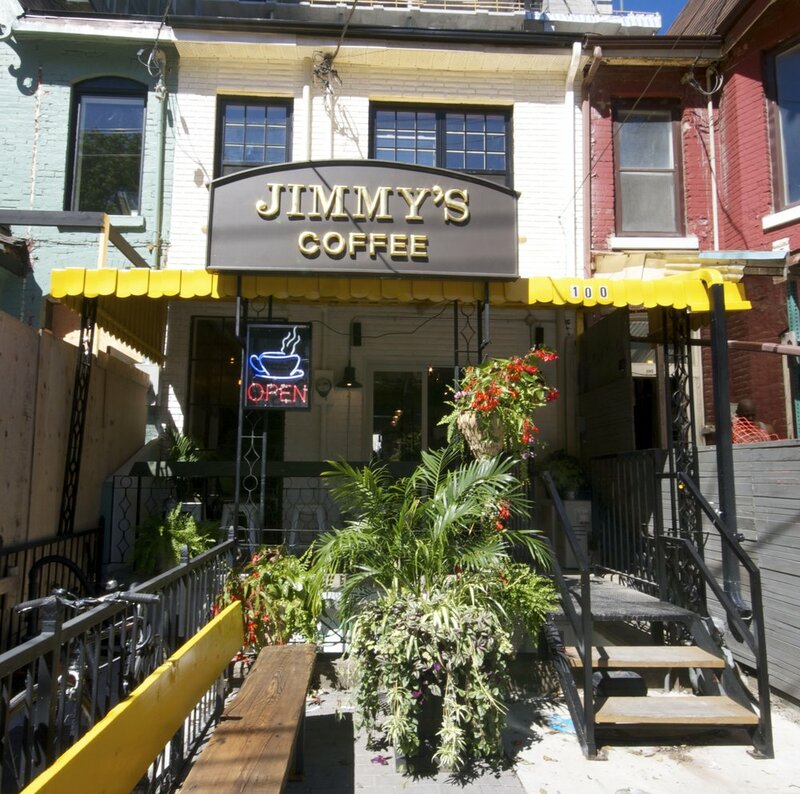 Jimmy’s Coffee on Gerrard St. West was our third location in May 2014. If you’re looking for Jimmy’s, you won’t be able to miss the stand-alone brick building with a giant Mount Jimmy’s Rushmore mural alongside the wall. Jimmy’s Gerrard West is just steps from Bay Street, nestled near hospitals and universities. Jimmy’s Gerrard West has plenty of studying space, spread over three floors. Tip! The third floor doubles as a boardroom rental space. Jimmy’s Coffee on Ossington Ave. opened in November 2015. This was the fourth shop in our growing coffee empire. Ossington, known for its boutique shops, intimate bars and independent cafes, is the perfect place for a lazy weekend stroll. Jimmy’s Ossington has lots of seating, ceiling murals and a communal table in the back for independent laptop work. Of course, you could also try snagging one of the cozy chairs and warm up by the fireplace during Toronto’s colder months. Jimmy’s Coffee on Queen St. West opened in the swanky front pocket of the Frank + Oak store in May 2016. Queen West, named one of the hippest neighbourhoods in the world, is a popular destination for Torontonians and tourists alike. Jimmy’s Queen West is a small but bright location. If you’re lucky, you can grab a stool by the window and watch the world go by, sipping a beverage from our signature yellow lids. Jimmy's Coffee on McCaul St. was the sixth location to join the Jimmy's family. Opened in October 2016, Jimmy's McCaul lives just around the corner from Baldwin Village, a charming pocket filled with local eateries and boutiques. A few steps away from OCAD, U of T, and the University Health Network, Jimmy's McCaul has plenty of seating, a cozy fireplace and beautiful atmosphere for comfy studying or hangouts. The highlight is the open concept barista training area that can be seen from the cafe through old factory windows. If you're lucky you might be able to pick up a few pointers! Our first café located outside the downtown Toronto core can be found in a strip of locally-owned businesses in Mimico Village. Originally a diner, we've transformed it into the warm, cozy coffeeshop for which Jimmy's is renowned. Perfect for this longstanding Etobicoke community whether you're looking to catch up with friends, heading to catch a train to work at Mimico GO Station or grabbing a coffee for the walk down to nearby Humber Bay Park. You can't miss it with the amazing neon sign newly refurbished to its original glory!